Urinalysis showed innumerable white blood cells, leukocyte esterase 3+ and negative nitrite. A catheter was placed and drained 1 L of yellow cloudy urine. The patient refused admission and he was prescribed ciprofloxacin 500 mg BID empirically and was sent home with a foley catheter in place with plans to follow up with Urology. He returned to the ED the following day because his foley catheter was not draining urine and he noted leaking around his catheter. CT scan was obtained and showed ill-defined areas of increased and decreased attenuation within the urinary bladder lumen and left hydroureteronephrosis. Which of the following statements regarding Candiduria is true? The correct answer is 1. Most patients with candiduria are asymptomatic and the yeast merely represent colonization. Infected patients may have symptoms (dysuria, frequency, suprapubic discomfort) while others might not. Pyuria is so common in patients with a chronic indwelling bladder catheter that it cannot be used to indicate infection. Neither the presence of pseudohyphae in the urine nor the number of colonies growing in culture (unlike bacterial cultures) help to distinguish colonization from infection. Ascending infections are rare but usually subacute or chronic, unilateral and can cause perinephric abscesses. 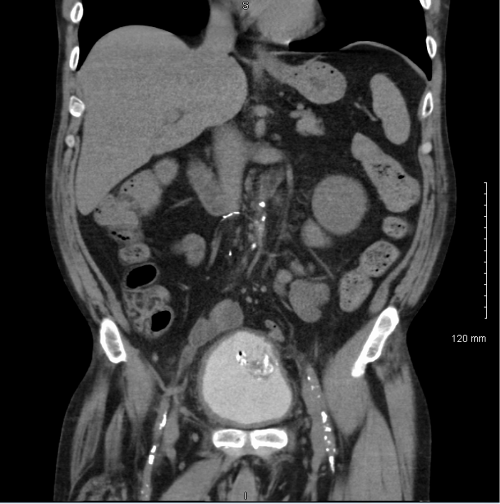 Fungus balls in adults are uncommon with less than 10 adult cases reported in the literature. Risk factors include uncontrolled diabetes, prolonged use of antibiotics or steroids and immune compromise. Classic laboratory findings include marked leukocytosis, pyuria, hematuria and a concomitant bacterial urinary tract infection. 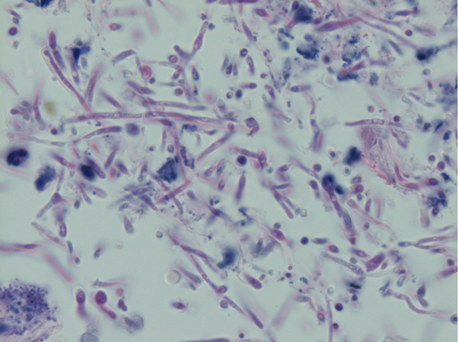 Most cases are caused by Candida species although Aspergillus has been implicated in a few cases. The kidneys are the most commonly involved organ in disseminated candidiasis and there is a higher propensity of fungus ball formation in neonates. -Agnes Balla, MD is a 1st year anatomic and clinical pathology resident at the University of Vermont Medical Center.